Paris climate change agreement: Aspirational, in a good way. The Paris Climate Change Agreement Is Going to Be Highly Aspirational. That’s Exactly What We Need. 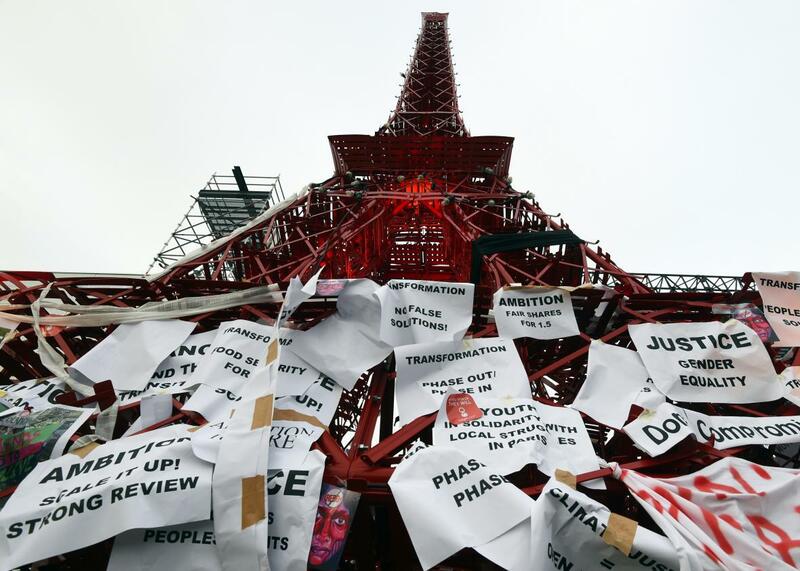 A replica Eiffel Tower made of bistro chairs is seen covered in messages related to climate change at the United Nations conference on climate change in Paris on Dec. 11, 2015. It’s the last day of negotiations in Paris, where representatives from 195 countries are busy hammering out the first-ever global agreement on climate change. Thursday night featured the second consecutive all-night session, with negotiators using a fresh near-final draft agreement as a basis for the talks. As journalists placed bets on when exactly the conference might end, official delegations studied the new text and shuffled in and out of parallel closed-door sessions. Though some significant differences remained, the latest draft reflected the vast consensus that has emerged over recent days: that the world can’t screw this up. Thanks to tweets and a rogue Google Doc from inside Thursday night’s talks, we now know a lot more about what that final text might include when it emerges on Saturday. The negotiations seem to be taking a “build it and they will come” approach, hoping to signal urgency to the global private sector that the era of fossil fuels must end very soon, rather than command national-level emission reductions via international law, as previous climate talks have tried, and failed, to accomplish. The change in tack, as well as the exceedingly durable nature of the draft agreement—with five-year review cycles built to last a century—has provided significant optimism as the talks draw to a close. The latest draft also provides a provision to ensure essentially all major emitting countries are on board, though it would enable a hypothetical bloc of China and India to block the final plan entirely. That’s not necessarily a bad thing, though, because both India and China have separately signaled their intention to work closely with the United States and Europe on climate action during the months leading up to Paris. More likely, it will ensure whatever agreement emerges from Paris will be widely supported. Other details that now seem likely to make it into a final agreement are a plan to address the growing risk of mass climate-induced migration, newly strengthened protection for the world’s forests, a call for all nations to end fossil fuel subsidies, and the best acronym in history: CBDRILONCWRC, which stands for “Common but Differentiated Responsibility in Light of National Circumstances With Respective Capability”—a nod to the language of the game-changing U.S.-China climate agreement last year that paved the way for the unique voluntary-yet-binding structure of the Paris agreement. The primary remaining issue is the balance between scaled up—though uncertain—foreign aid demands by developing countries and increasing pressure on rapidly developing nations to cut emissions as quickly as possible. These two issues are intertwined, so the final agreement will likely reflect a last-minute “nothing is decided until everything is decided” rush to find common ground. A few minutes before 3 a.m. Paris time, the Barbados representative implored compromise, warning that if the Paris agreement failed, it would soon be “archaeologists, not climate scientists” that would be studying the impact. Shifting alliances may yet push to water down the agreement: For the United States and Europe’s newly formed “High Ambition Coalition”—a group that’s seemingly formed primarily to pressure India into partially relenting on its demand for additional support in transitioning toward renewable energy—hard targets on financial assistance to developing nations are a deal-breaker. From the other perspective, a critical provision for so-called “loss and damage”—essentially, reparations for what vulnerable nations on the front lines of climate-related impacts consider is an increasingly dire problem largely not of their own making—is still in doubt. This debate is more than just a detail—it also informs the overall goal of how quickly the world can reduce its emissions. In order to achieve the newly bold temperature target that the Paris talks have rallied around, global carbon emissions must peak within the next five years—before the draft Paris agreement would even enter into force—and then rapidly decline thereafter. Wealthier countries with greater historical emissions—like the United States—would need to decline to near-zero emissions over the next 15 years, with the rest of the world following by midcentury. Poor countries simply will not be able to sustain that scale of effort without significant financial and technical help from rich countries. A panel of scientists, nervous that most people—including, perhaps, the participants in Paris themselves—might not understand the scale of change those reductions would require, held a Friday afternoon press conference to discuss the inconsistency between the draft agreement’s temperature target and its emissions reduction requirements. In a particularly egregious example, the U.N. is promoting a carbon offset for attendees’ air travel to reach the Paris conference for just one dollar. Climate activists, dissatisfied with the agreement’s aspirational nature, have planned large-scale protests in defiance of the lingering heightened security in Paris, which will include “mournful” fog horns and red banners hundreds of feet long to symbolize the non-negotiable nature of climate change’s impact on particularly vulnerable people.